After a decade of mostly familiar names, Super Bowl XLVII is set to provide some welcome new blood under center. Sunday will mark the first title game in five years to feature two quarterbacks who’ve never been here before, but that’s about where their similarities in experience end. For Colin Kaepernick, this start in New Orleans comes barely three months after the first of his NFL career. For Joe Flacco, it’s the next step in his playoff success. But even with all the pressure young Kaepernick is set to face, in my mind, and in terms of scheme, support, and circumstance, there will be more of it placed on Flacco. Like the 49ers, previous versions of these Ravens relied on a bruising running game and great defense to buttress a young quarterback as he improved from week-to-week. This year, those areas of strength have lagged. After a long stretch of dominance, Baltimore’s famed and historic defense fell to the middle of the pack in nearly every category, and although the Ray Rice–led running game is still formidable, its efficiency and production took a step back. This means that for the first time, the Ravens have become Joe Flacco’s team, and more than ever, Baltimore has relied on its passing attack. Ray Rice has been a steady bailout option for most of Flacco’s career, but it’s Torrey Smith, Anquan Boldin, and Dennis Pitta who will be the keys come Sunday night. Baltimore fired offensive coordinator Cam Cameron after a late-season loss to the Redskins, but since Jim Caldwell has taken over, the underlying structure and scheme of the Ravens’ offense has gone essentially unchanged. It’s a scheme based on the old Don “Air” Coryell offense, versions of which the 1990s Cowboys and ’99 Rams both rode to Super Bowl wins. Flacco’s favorite go-to, chain-moving play is actually an old staple of that offense used by both of those teams called “F-Post.” The original F-Post receiver was great San Diego Chargers tight end Kellen Winslow, but over the years, teams have adapted the play so that any inside receiver — a tight end, running back, or slot receiver — can run the key route. With the Cowboys, it was trusted tight end Jay Novacek; while in St. Louis the best “post” receiver was Marshall Faulk, who lined up anywhere from the backfield to split out wide. 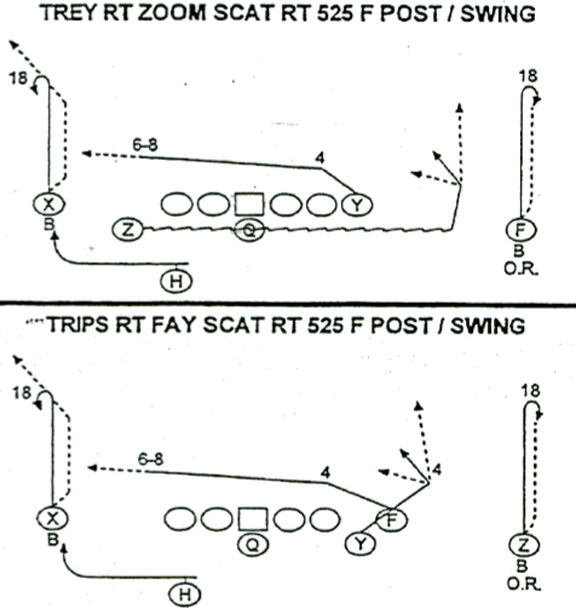 The key to the play is that the “Post” in F-Post isn’t really a true post at all; it’s what some coaches call a “crease” route, and as the diagram shows, it simply requires that the receiver release to the outside and then break to the inside at one of any number of angles depending on the defense’s leverage. In short, it’s the perfect play for crafty, physical receivers like Pitta and Boldin to set up an interior defender before breaking across his face. Along with receivers fit for the play’s design, Flacco is aided by the ease of the play’s main read: Get the ball to the guy whose job it is to get open. Against both the Broncos and the Patriots, Flacco repeatedly hit both Pitta and Boldin to keep drives alive. Against San Francisco, that task might not be so simple. For most of the past two seasons, defensive coordinator Vic Fangio’s defense has been one of the best in football at shutting down both the run and the pass. When the two teams met last season, the Ravens had the more impressive defensive showing in their 16-6 victory, but Fangio’s squad took Flacco to the turf all night and held Baltimore to one of its worst offensive outputs of the season. The key to the 49ers’ success in that game, as well as for much of the past two years, is rooted in a common misconception about their defense. It’s often noted that the 49ers play almost entirely with two safeties deep, splitting the field into halves while the remaining defenders play man-to-man coverage. This tactic, which also relies heavily on the front seven to stop the run, is known as “Cover 2 Man” defense. The notion that the 49ers use this coverage almost exclusively is, like most misconceptions, rooted in some fact. The 49ers do use this coverage a great deal, but if they used it on every down, San Francisco’s defense would be much easier to attack than it actually is. Generally, the cornerbacks will play a type of man coverage on the outside receiver, or no. 1, receiver. 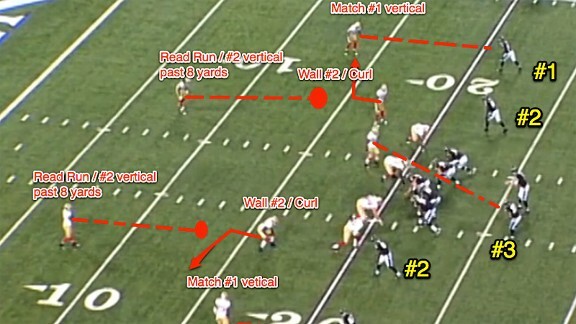 If that receiver runs vertical, the corner will “match” him and play man-to-man. If the outside receiver immediately breaks inside, the corner’s assignment changes. Instead of playing man-to-man, he sinks back and looks to pick up a receiver — likely the slot — running a route deep and to the outside. When a corner makes an interception on a play just like this, he’s often described as “freelancing,” but this kind of bait-and-switch is actually part of his assignment. The interior defenders, usually nickel backs or outside linebackers, “wall” or block the inside receivers from running quick inside routes like slants and are also responsible for any quick pattern to the outside. If that inside receiver releases straight down the field, the responsibilities change entirely. The safeties then pick up that receiver in man coverage seven-to-eight yards past the line of scrimmage, while the nickel back or linebacker sinks into a zone and looks to stop any curl or inside routes. In short, if the offense tries to cross its receivers, the defense will look like zone. If those receivers run straight downfield, it will look like man-to-man with some extra help. If all that confusion wasn’t enough, the 49ers will sometimes call a different coverage to each half of the field. Sometimes, that means Cover 2 Man to one side, and a 2 Read look to the other. Other times, it’s Quarters to one side, with man-to-man or 2 Read to the other. This presents a significant challenge for Flacco, whose greatest strength has never been cycling between options in search of an open receiver. Like any defense, though, there are ways to attack it effectively, and against teams who use these differing coverages, there are two common responses. One is to use a lot of crossing receivers. This both creates pick routes if the defense is in man-to-man coverage and forces the defense to expose itself as zone when playing a pattern-match scheme. Discovering the latter then allows the offense to exploit the windows between zone defenders. This was basically the approach Atlanta offensive coordinator Dirk Koetter took for much of the NFC Championship Game, and it worked well. On Julio Jones’s first touchdown, the Falcons bunched Jones with Tony Gonzalez. The proximity between the two created confusion about which player represented the outside receiver, and the mix-up was obvious in the coverage. 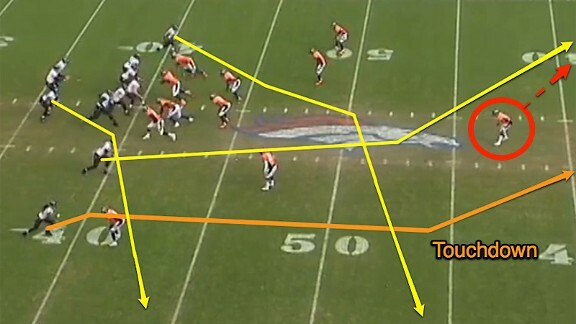 The Falcons also sought to hit the creases between defenders playing what became the short zones. On several early completions to Roddy White, the 49ers’ corners dropped off of him as he broke inside, and the linebacker or nickel defender failed to react, remaining in man coverage. These missteps led to post-play conversations that helped improve the 49ers’ communication and allowed them to shut Atlanta out in the second half. I expect the Ravens to use some of these crossing and bunch tactics on Sunday, but it’s the other method of attacking this type of defense that’s more likely to be a key to Baltimore’s game plan — embracing the man coverage. This involves sending receivers straight down the field before breaking late (or in Baltimore’s case, sometimes not at all). These types of routes both force San Francisco into the man version of the 2 Read defense and fall in line with the old Air Coryell attack the Ravens run. Baltimore would then be able to play more to Flacco’s strengths — courage in the pocket, an extremely strong arm, and an ability to execute simple man-to-man reads — rather than forcing him to expose voids in shifting zone coverages. Unlike San Francisco’s two-deep look, Denver only had a single deep safety on the play, but the concept of the attack is similar. The outside receiver goes deep and to the post, and the quarterback is left to read how the safety reacts. With all the action going on in front of him, the safety on this play took the inside receiver, and Flacco had no trouble laying the ball out for a wide-open Torrey Smith. These are the moments that make the Baltimore offense dangerous. They plod, they dink, they dunk, and after a few off-tackle runs, lull the safeties to sleep — bang! — they hit you with the big one, usually with Smith streaking down the field. Typically, hitting these types of long plays would be a tall order against a 49ers defense that gets after the quarterback, but the recent injury to defensive tackle Justin Smith has hampered the Niners’ pass rush. Smith says his status has improved, and that’s good news for San Francisco and for linemate Aldon Smith. Not allowing Flacco to take his shots downfield will be a big part of slowing down the Ravens, but if Baltimore’s offensive line can hold up, Flacco’s big arm — and his name — might be finding their place in Super Bowl history.